After taking a few days off to focus on the yard, we are in the final stage of the kitchen. 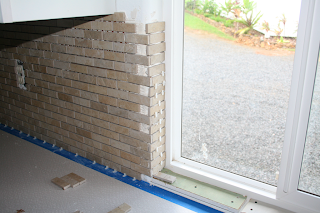 We started installing the the back splash on Wednesday afternoon. John went to town and rented a wet saw after we realized we had way too many small cuts to use the table top cutter we used for the floor. 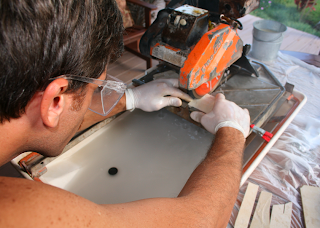 Today we will do the last small section and should grouting on Sunday or Monday. We promise...final pics soon. 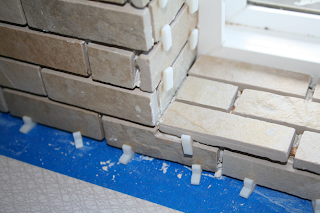 Until then, here are a few shots of the window ledge that I had to build up with an extra thickness of sheet rock. Genius! Go Construction Cosmonauts! It looks GRREAT!